With names like "Rogue" and "Intensity," we're totally picturing these phones breaking out of their tethers in Verizon stores, wreaking havoc, pickpocketing customers, and stealing identities during credit checks -- but in reality, we've just got a couple of unassuming QWERTY sliders in the mix here. Starting with the lower of the two, the Intensity keeps things simple by leaving out 3G and sticking with a 1.3 megapixel camera, so we're thinking this slots in right underneath the Rival as far as Big Red's text-heavy wares go. Moving up, the Rogue is looking to put the Glyde out to pasture with a 3.1-inch WVGA AMOLED display, 3 megapixel cam with autofocus, HTML browser, and naturally, TouchWiz. Both units hit streets on September 8; you'll pay $199.99 with a $100 rebate on a new two-year agreement for the pricey Rogue, while the more pocketbook-friendly Intensity runs $79.99 on contract with a $50 rebate. 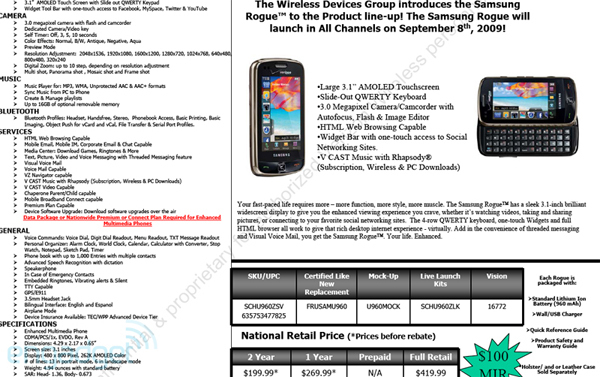 Verizon preps Samsung Rogue and Intensity for September 8 launches originally appeared on Engadget Mobile on Wed, 26 Aug 2009 12:15:00 EST. Please see our terms for use of feeds.